This week last year, I was in Portland, Oregon for the IACP conference. We stayed at the Ace Hotel there which has a Stumptown Coffee Roaster in the lobby. This was probably my second favorite feature of the hotel, as we could have awesome coffee and a snack before walking to the conference. 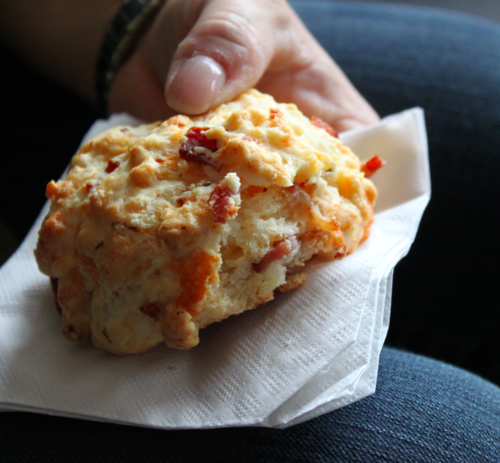 One of my favorite snacks were their Bacon Cheddar Biscuits, even as they were served cold. Obviously I've been thinking about them since then and had to do something about it as a trip back to Portland isn't on my schedule anytime soon. I will, however, be in Austin for this year's conference. 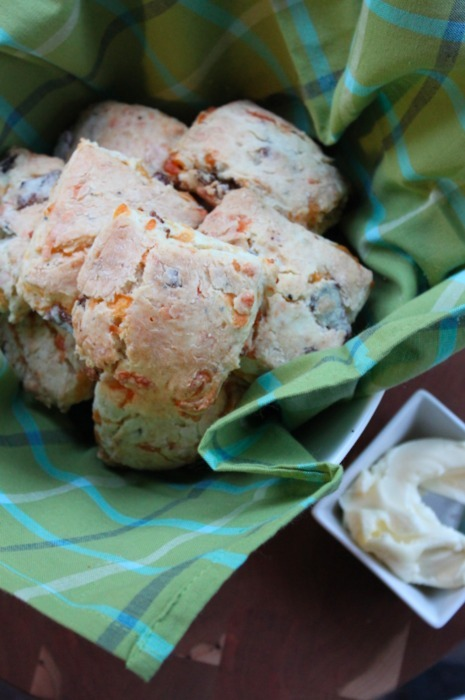 You know that I love a recipe that is simple, and these are no exception. As an adaption of my cream biscuits I only have to remember one recipe. In the future I'll probably adapt the original cut biscuits to more of a Northern style drop biscuit, which I think the Stumptown version was. Combine the flour, baking powder, salt and sugar in a large mixing bowl. Add the bacon and cheddar and stir briefly. Add the cream, 1/2 cup at a time, stirring gently with a wooden spoon. The mixture should be wet, but not super sticky. Gently knead on a floured surface for one minute. Roll the dough to about 1/2 inch thick. Cut into 12 squares (next time I will probably use a pizza cutter for this). Place evenly apart on an ungreased baking sheet. Brush generously with the melted butter and sprinkle with kosher salt. Bake for 15 minutes or until tall and golden brown. Devour immediately, with butter and coffee.